The exterior care range from Mellerud is now available exclusively from Centurion Europe. 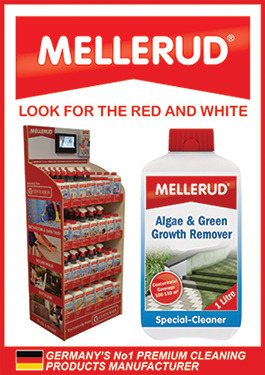 Mellerud products, which aim to provide effortless cleaning power and protection, are designed to tackle a variety of outdoor and garden tasks include Algae and Green Growth Remover, Garden Furniture Cleaner, Oven and BBQ Cleaner, Awning Cleaner and Waterproofer. Mellerud offers great potential to boost sales and Centurion has developed a range of merchandising options that show Mellerud products effectively, giving great in-store presence and providing a space-saving alternative to other cleaning brands.